안동 봉정사 목조관세음보살좌상은 여러 개의 나무들을 접합한 접목조기법(接木造技法)으로 이루어졌으며 눈은 수정을 감입하였다. 사찰에 전하는 대웅전관음개금현판(大雄殿觀音槪金懸板)과 1753년의 중수원문(重修願文)을 통하여 1199년에 처음 조성되어 1363년에서 1364년 사이와 1751년에서 1753년 사이에 중수된 상임을 알 수 있다. 양식적으로도 이 관음보살상은 아직 고려적으로 변모하지 않은 이국적인 풍모, 마치 배흘림기둥을 연상시키듯 맵시 있게 땋아 올린 보계(寶髻), 어깨 위에서 중첩된 고리모양을 이루며 늘어진 보발(寶髮)의 표현, 긴장감 넘치는 옷 주름, 세련된 조각기법과 균형미 넘치는 비례 등에서 중국 남송대의 불상이나 12세기 말에서 13세기 전반으로 추정되는 안동 보광사 목조관음보살좌상이나 서산 개심사 목조아미타여래좌상 등과 비교 된다. 따라서 이 상은 에 기록된 대로 승안(承安) 4년, 즉1199년(高麗 神宗 2) 무렵에는 조성되었을 가능성이 높다. 이 관음보살상은 고려후기 새롭게 대두하는 신고전주의(新古典主義) 양식 불상의 시원적 형태를 간직한 상으로 이러한 불상 양식의 성립과 전개과정을 살펴보는데 매우 중요한 상으로 평가 된다. 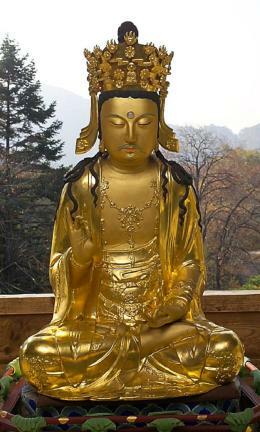 The Wooden Seated Avalokitesvara Bodhisattva of Bongjeongsa Temple in Andong is made by assembling several separate wooden pieces. The eyes are inset with crystals. The wooden tablet recording the information about the re-gilding of Daeungjeon Hall and the prayer text, written in 1753, at the time of the temple’s repair, tell us that this statue was created in 1199 and was repaired for the first time between 1363 and 1364, and for the second time between 1751 and 1753.This early Avalokitesvara statue is not yet in the distinctive style of Goryeo. The appearance of Avalokitesvara Bodhisattva is quite exotic, and the hair is braided and mounted into a top knot, in a shape reminiscent of a house column with a flared middle, with the hair on the shoulder rendered in large overlapping loops. The drapery, meanwhile, is rendered with great fluidity, and the body displays fine proportions. The overall sculptural technique shows a high degree of sophistication. These characteristics make the Avalokitesvara Bodhisattva of Bongjeongsa Temple comparable to Chinese Buddhist statues of the Southern Song period or Goryeo Buddhist statues such as the Wooden Seated Avalokitesvara Bodhisattva of Bongwangsa Temple in Andong, dated to the late 12th to the early 13th century, or the Wooden Seated Amitabha Buddha of Gaesimsa Temple in Seosan. Therefore, this statue is indeed likely to have been created in 1199 (the second year of the reign of King Sinjong during the Goryeo Dynasty) as indicated in the wooden tablet describing the repair of Daeungjeon Hall. This statue of Avalokitesvara, exhibiting stylistic characteristics that were later seen in Neoclassical Buddhist sculptures which emerged in late Goryeo, is considered to cast important light on the history and evolution of Goryeo Buddhist sculpture.